For my sister’s wedding shower, I made rice krispie treats with mars bars melted on top and they were to die for. I cut them into small bites and they were the perfect mix of marshmallow, caramel and chocolate-y goodness. If you are a child, please make sure you are supervised by an adult while making these, you need to use the stove and sharp knives. I didn’t use a recipe to make the rice krispie squares…you can use your own recipe or find one online. Here’s the recipe from the rice krispies website. I like my rice krispie squares on the marshmallow-y /softer side and this recipe probably tastes better when the squares are softer because then it melts in your mouth. 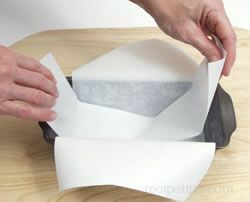 I put parchment paper into a 9×9 square cake pan to line the bottom and sides of the pan- like this. If you don’t want to waste too much paper, just use the one long sheet of parchment paper which will allow you to pull the rice krispie treats from two sides. I spooned out the rice krispies and marshmallow mixture into the pan and pressed the rice krispies down with my spoon. Then I covered the rice krispies with another piece of parchment paper and used another 9×9 cake pan to press down the rice krispies (not too hard because you don’t want to flatten your treats too much or they will be too crunchy). Make sure that the top of your rice krispie surface is even (you don’t want uneven chocolate) and make sure there are no spots between the rice krispies and the cake pan or else the chocolate will seep through the gaps. As that cooled down, I started to make the mars bar topping. I used about 35 mini mars bars for my topping. You can use more or less depending on how thick you want your chocolate/caramel. With 35 mars bars and a 9×9 cake pan, the chocolate/caramel part was about 1/4″ thick. I cut the mars bars into pieces so it would melt faster. In a pot on medium heat, pour your mars bars in and make sure you are constantly stirring so the bars don’t burn. You could also do a double boiler method (where you put a bowl on top of boiled water if you don’t want to risk burning the mars bars). The chocolate and caramel will melt fairly quickly, but the nougat takes a while to melt down. Make sure to use your spoon to get rid of the bumps of nougat. The mixture was fairly thick so I added a splash or two of milk to thin it out. Once everything has melted and you have no more lumps, pour your mars bars over your rice krispie treats and let it cool down. Once the chocolate has hardened, use a knife to go around the edges of your caramel/chocolate topping to unstick it from the pan/paper. Pull the parchment paper out and now you can cut your rice krispie treats however you want them. I used a large kitchen knife to cut the treats into strips and then switched to a serrrated knife to cut them into bite size pieces. To help you cut, you can run the knife under hot water to warm it up (and wipe off the water), the heat will help slice through the caramel/chocolate and prevent the marshmallow from sticking too. Make sure your knife is clean, if chocolate, caramel, marshmallow and/or rice krispies start to stick to your knife, wipe it off or clean your knife. Or else you start to get rice krispies on the chocolate part (as you can see above, my knife wasn’t completely clean and some of the rice krispies got onto the chocolate). Small bite size pieces are the perfect size because you don’t have to bite into the caramel which might stick to your teeth. If you have any questions, please feel free to ask!